As promised in my last post for Sesame Salmon & Snap Peas, I am now presenting you with the second half of my scrumptious dinner that I made the other night using recipes out of my Hungry Girl To The Max! 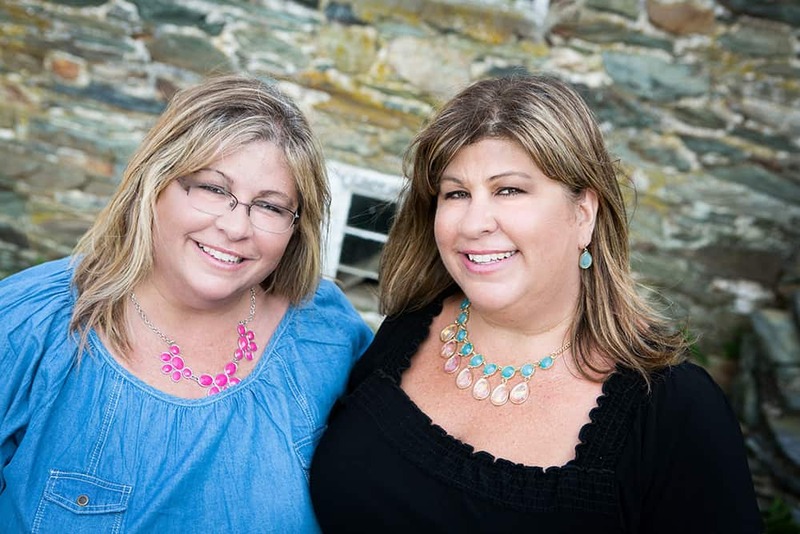 The Ulitmate Guilt-Free Cookbook. 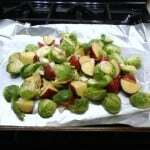 This recipe is another super easy, foil pack recipe, called Hustle ‘N Brussels Pack Attack. 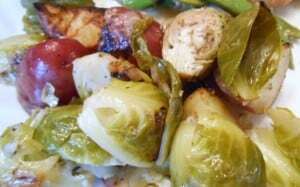 Now most people I know stay as far away from brussels sprouts as physically possible, my son included. However, they are so good for you and actually a very satisfying and tasty veggie to include in your diet. A quick little story about me and brussels sprouts: When I first met my husband, I wanted to find out certain things about him to find out if we were compatible enough to sustain a good relationship. I went through my mental list: Does he love the Redskins? Check! Is family important to him? Check! Does he ride a motorcycle? Check! Do we have chemistry? Check! Does he have good morals and a good work ethic? Check! The list goes on and on, but another thing that was much lower on the list, but yet still an important item was: Does he like brussels sprouts? And the answer was yes! A match made in Heaven! Lay a large piece of heavy-duty foil on a baking sheet and spray with nonstick spray. 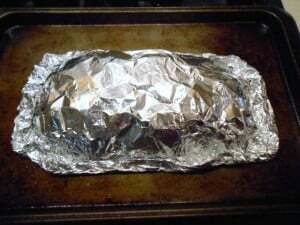 Distribute onto the center of the foil, and cover with another large piece of foil. 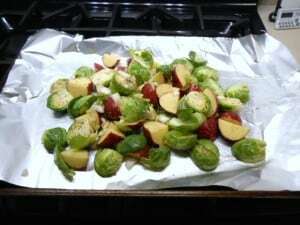 Fold together and seal all four edges of the foil pieces, forming a well-sealed packet. Bake for 30 to 35 minutes, or until veggies are tender. As with my other foil-pack recipe, this one was so easy to make and so tasty to eat. I served it as a side dish with my Sesame Salmon & Snap Peas. 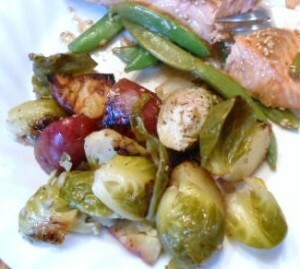 The bottoms of the potatoes and brussels sprouts browned a little bit, so they had that roasted taste to them. Mmmmm Mmmmm! So you say you don’t like brussels sprouts? Have you ever tried them? Do me a favor and just try them, especially in a recipe like this one. I’m happy eating them steamed with some salt and pepper on them. 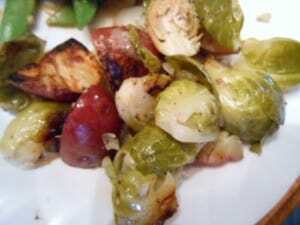 But if you dress them up a little bit like in this recipe, you might find that brussels sprouts have gotten a bad rap for no good reason! This might even be your favorite new veggie! Yum, this sounds great and so easy. I’m drooling looking at the pictures–looks like you could make a meal of just them! I have to try it!!!!!! 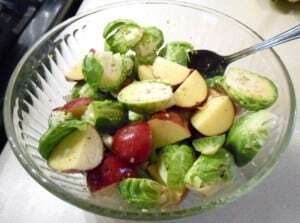 That’s what I love about brussels sprouts as opposed to other veggies. They stick to your ribs better  And they’re so good!